Although they have been designed the be fairly durable, attaching USB flash drives to key-chains and briefcases or carelessly throwing them onto desks and into draws exposes them to constant knocks, hot temperatures and other day-to-day dangers, which the devices aren’t designed to continually handle. “The physical appearance of a USB key makes people think they are simple and hardy devices, but they contain delicate parts and use complex algorithms to store data on the internal memory chip. “If you are going to rely on one of these devices to store priceless data, then it should be treated accordingly,” said Mr Toloo [PDR Managing Director]. With the increasing number of USB brands now available, manufacturing quality can also be an issue, and physical defects and faults can cause sudden failure. 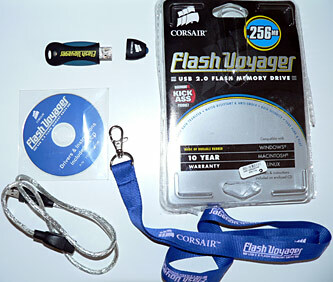 So I could have saved a few dollars by buying a generic brand, but I decided to purchase a 256MB Corsair Flash Voyager USB Drive instead because Corsair has a good reputation with computer/electronics enthusiasts. Corsair Flash Voyager USB drives are rugged, stylish, compact, reliable, and exceptionally fast, making them ideal for transporting MP3s, digital images, presentations and more. With data transfer rates up to 19Mb/sec, Flash Voyager drives are fully Hi-Speed USB 2.0 compliant, and are backward compatible with USB 1.1. They support Plug and Play with most operating systems. Their durable rubber casing is easy to grip and water resistant. These highly portable drives are available in capacities ranging up to 16GB. Security application lets you create a password-protected partition. “With its water-resistant feature, the Corsair 512MB Flash Voyager certainly has an edge over competing USB flash memory drives. It survived all our three water resistance tests, even a 30-minutes rinse cycle! “Apart from the near-certainty that you’re going to loose the lid, I really can’t find much to gripe about that’s worth page space. Rubber armored for those clumsy moments and fully sealed to keep out the pocket fluff and stop that ugly “loose change battle-scarred” appearance that hard plastic Flash drives so often suffer from, it’s only real failing for some will be the lack of a pocket clip. “They say a goldfish has a 3 second memory. Well Corsair’s memory fish lasts ages longer than that in thescircumstances. Corsair state that the module is water resistant but as you can see after 2 hours in a fish tank all you need to do is dry off the casing and plug it in again. the cap isn’t secured well enough and is prone to falling off quite often. Corsair should have attached the cap to the Flash Voyager by some kind of durable connection eg: a string line made of a flexible but durable material like the metal covered with clear plastic USB cable extender they supply with the drive. The synch feature is not that important for me, if you want synch software you could get it seperately, still buy the Corsair Flash Voyager and spend less than buying the Sony 8 gb Micro Vault Pro with included synch software. Corsair Flash Voyager it is. Thank you for your time and assistance. I bought a Corsair drive and you are right. the cap keeps falling off until I finally lost it. Alternatives with a captive cap (such as a twist open design) are much more expensive. I replaced it with another brand – which suffered the same fate even though the cap was a tighter fit. It would be great if someone made and sold generic caps. What was the original designer thinking in having a press fit cap? Please send an email request to [email protected] along with your name address and phone number and a new cap will be sent to you ASAP! Recently bought a Corsair 2GB Flash Voyager, one reason was it is advertised as including “Drivers for Windows 98 on CD”. Unfortunately Windows cannot recognise/find the drivers on the CD and neither can I. Has anyone else found them? Totally agree with the comments of the data recovery specialist. We see plenty of USB disks in for data recovery work, mainly because people think that because there are no moving parts that they are robust. Actually they are not, they are built to a price and a very sensitive to knocks, and spending so much time sticking out of the front of a computer leaves them pretty vulnerable. USB devices are great for data interchange, but should not be relied upon as a backup. Data recovery from them when it is a matter of partition of file deletion is something that can be achieved, usually by downloading free software (so long as there is not a lot of file system fragmentation) rather then by spending money with a data recovery company. If anyone needs advice feel free to ask a question at http://www.data-recovery.eu.com/blog. We are a data recovery company, but target real recovery work rather than fleecing the people who have minor problems. Mate, I had a WD portable usb drive fall and not work. Went to Payam Toloo and was told it would cost $2400.00 to recover all the data and would take around a week. I had a friend Felix Forbes who mentioned a person (Cory Sharplin) that was good at these things. He asked me to get an identical unit and in front of me swapped the discs and all was good. Besides the new HDD he charged me only $120.00 (5% of Payam Toloo was charging).